A town in the north-west of the Freestate, position 27.3915°S 26.6153°E 1270m altitude. Also known as the maize capital of South Africa, that is because of it being in the centre of the maize growing region. 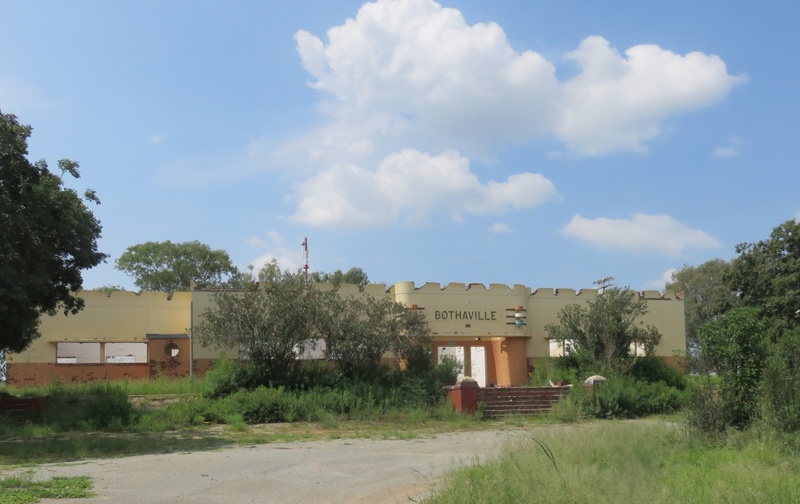 Establishing Bothaville was not straight forward. When during the 1880s it was seen that a town should be established in the area there were two contenders. 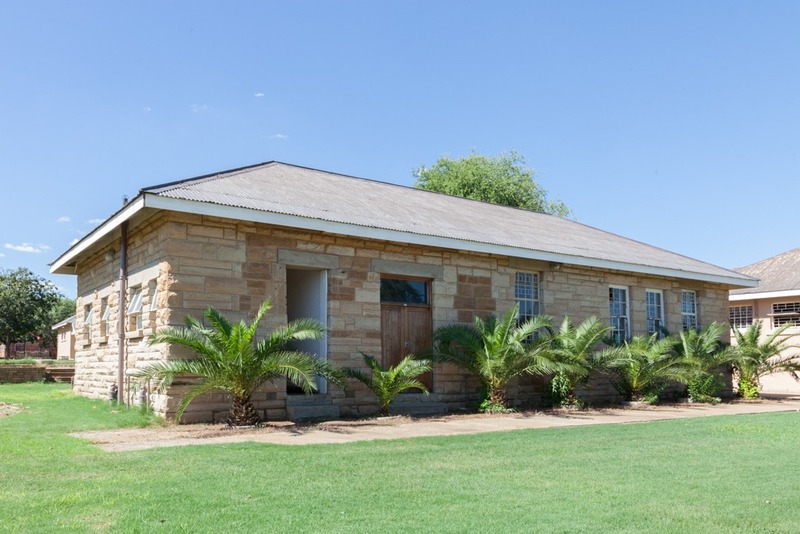 On the one side was Mr.L.Schultz, acting on behalf of a syndicate from Johannesburg, who was going to lay out a town on the farm Botha's Drift a few miles upstream from where Bothaville was going to be established. 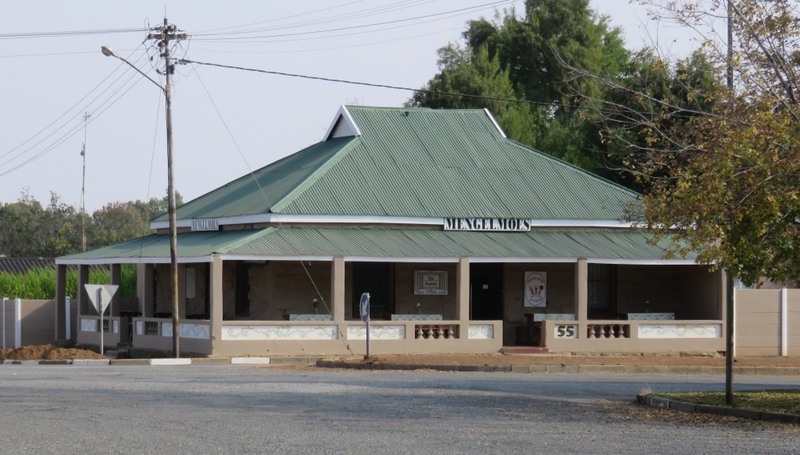 And there were the brothers C and M Bukes who wanted a town established at Gladdedrift. It was already the site where church services were held in a tent from time to time. 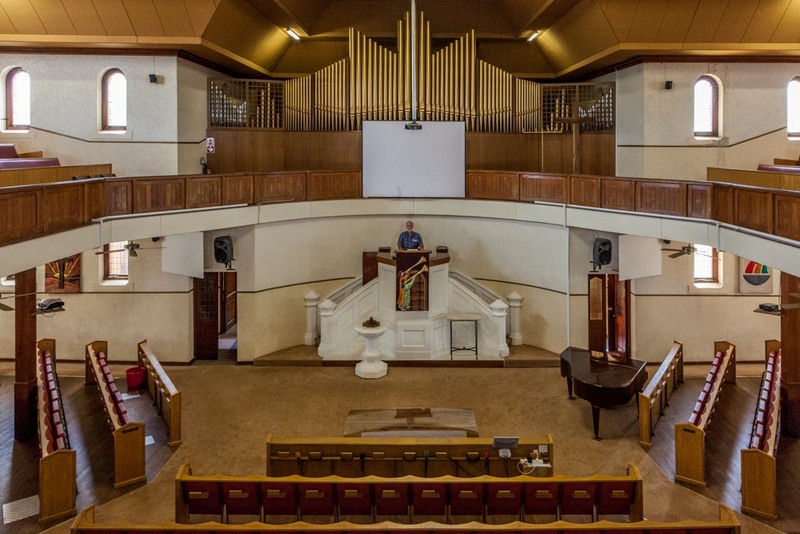 This congregation eventually ceded from the congregation Kroonstad and they built a church in 1891, thus establishing a centre around which a town could develop. 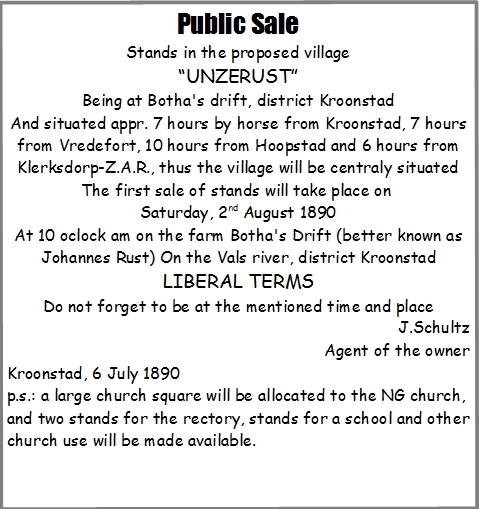 The advertisement on the right is for selling of stands in the proposed village on the farm Botha's Drift. It is worth translating, makes interesting reading. Now, don't get confused, like I was when I pieced this story together, this was not the advert for Bothaville, this was the competition trying to establish a town a few miles up-river. At the future Bothaville things moved somehow differently. 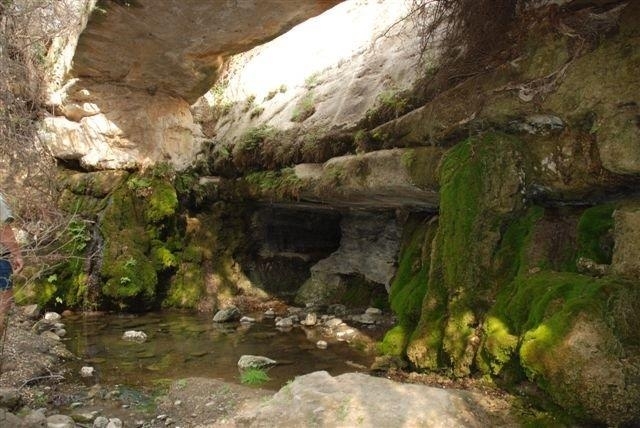 To the west bordering Gladdedrift was the farm Balkfontein, so named because a beam of sand stone above the fountain. The height above the fountain was the place where early church services were held. Four times a year the local inhabitants came together for a church service held by Ds van der Lingen from Kroonstad. 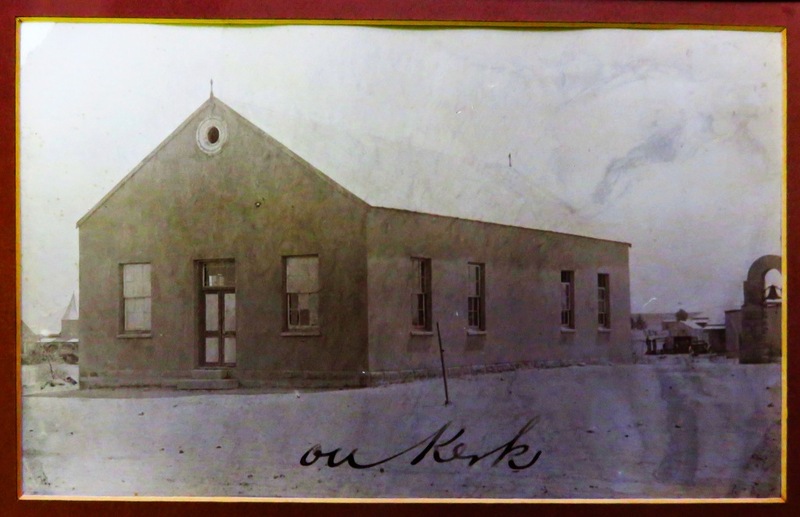 At a meeting held in 1889 at Balkfontein it was decided to ask to cede from Kroonstad to form their own congregation. 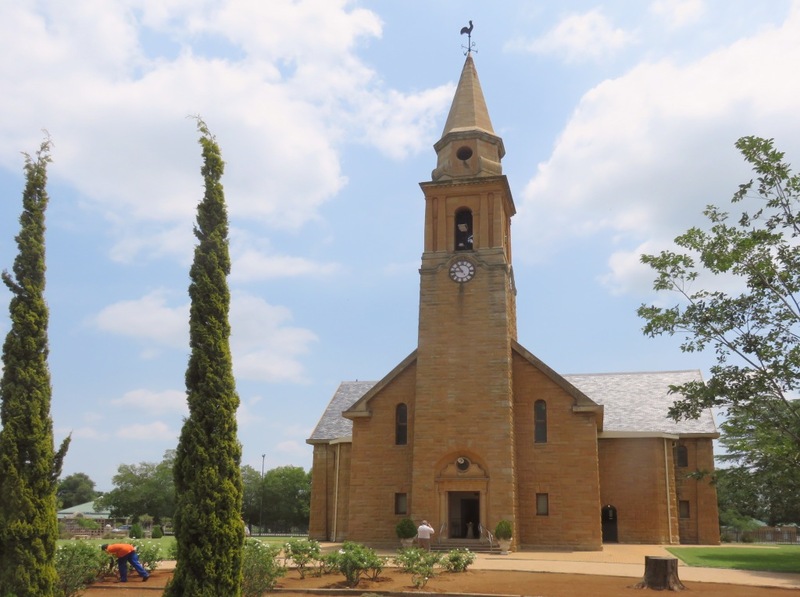 This was granted and a church built on the farm Gladdedrift. Houses started to be erected around this nucleus. 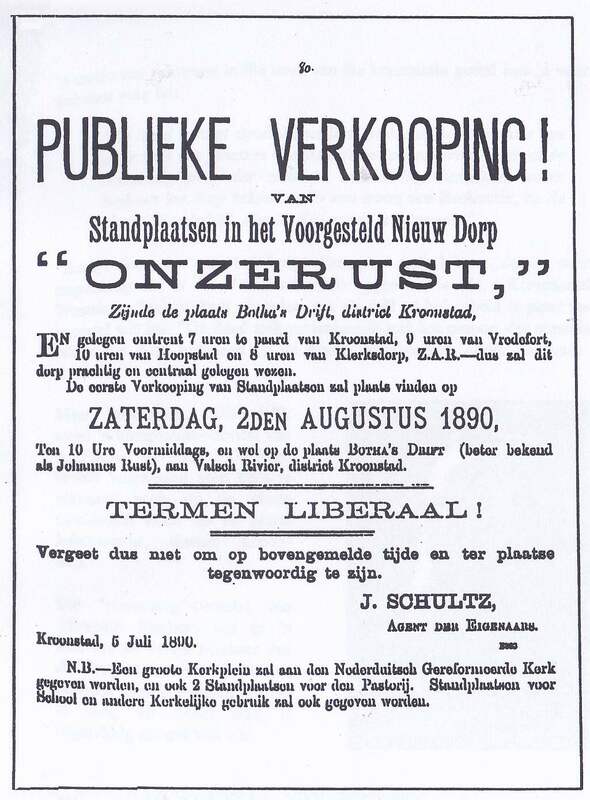 By the time the Volksraad got around to proclaim the town in 1893 there were already 15 houses. The picture on the left shows this church building. That is the Dutch Reformed Church, as mentioned above the first church was built in 1891, that one was superseded by a new one in 1918. This new one is something special, it is Gerard Moerdijk's first church. He had just started his carreer as an architect and his design won the competition. One can see aspects of his later work, the amphitheatre like seating around the pulpit. It has not got many of the curves so typical of his later designs. 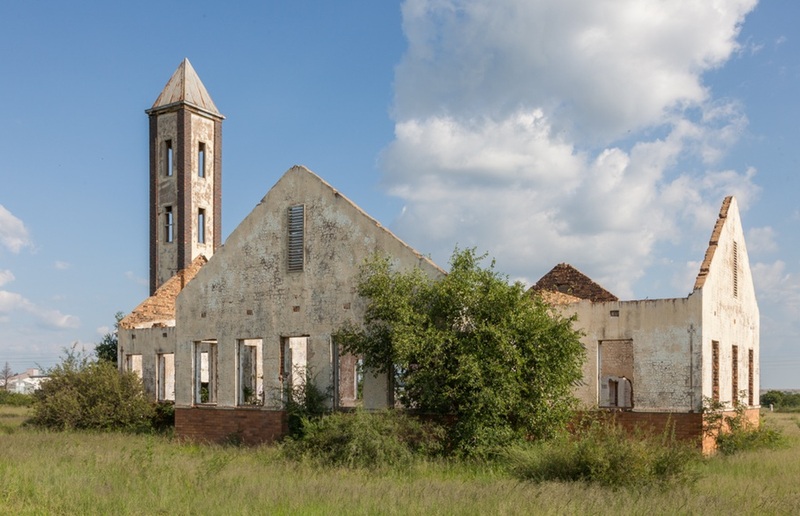 More information on the church can be found at the heritage portal. A rectory (pastorie) was built in 1898 at a cost of £2000, a beautyfull sand stone building, see picture on the left. For many years the most outstanding structure of the town. It is still standing and is being used as a nursery school. This structure can actually be seen on the picture of the old church, look at the left corner of the church. Before that pastorie was built the house of Mr.Carey was used to house the minister, see picture on the right. 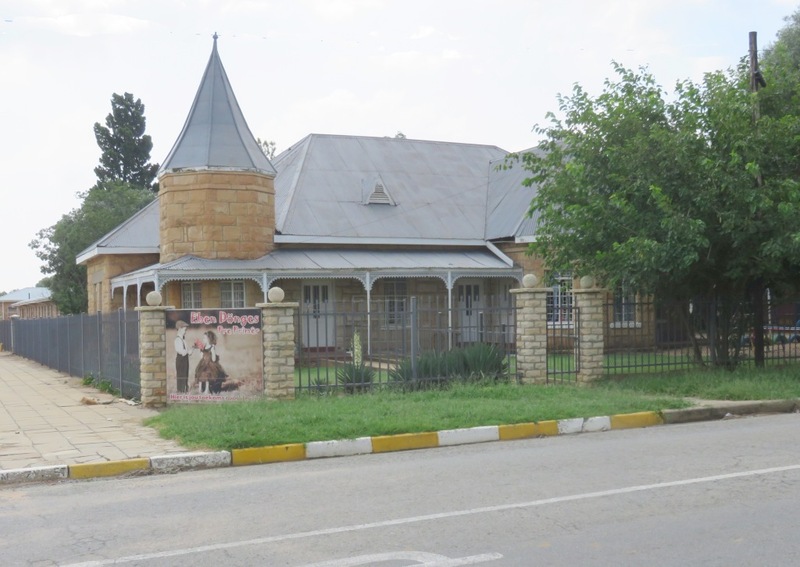 Like all buildings of Bothaville this one was burned down during the Boer War. It was re-built after the war, we can thus not be certain that it looks the same as before the war. With the large veranda around the house it certainly looks authentic. Approaching Bothaville from the north we noticed this spire sticking out of the veld. We had to have a look and see what it is. It obviously had been a church, now in ruin, and why in the middle of nothings? That called for some investigation. Google Earth shows that there used to be houses around here. It was the location, that is where the blacks lived in the days of apartheid and before. And the church was the NG Sendings Kerk, the missionary arm of the the NG church. The church with its attractive tower was built and inaugurated in 1958, see picture on the right from ref 4. But then the township was moved over to the present position to the north-east of the town. This is when the church fell into disuse and had its roof removed. I still have to find out whether a new one was erected at the other side. The first town hall was built in 1917, the picture on the right shows the corner stone of that building. It has been incorporated into the new town hall and states that the corner stone was laid by Mrs G.Smith, the wife of the Mayor on the 18 July 1917. I presume the new construction incorporated some of the older structure. The town hall served not only the town administration but also became a social centre and doubled up as a bioscope (cinema). 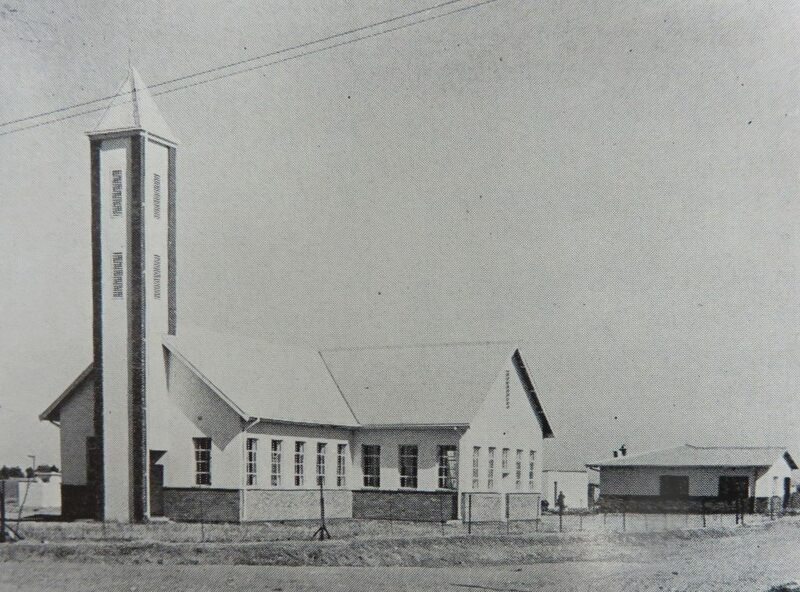 The new hall was erected in 1950, the corner stone states it was laid by the mayor Dr T Meyer on the 4th March 1950. Together with the desire to have their own church there was also the wish to have a school. In 1891 already they applied to the government for funds to build a few class rooms. This was granted and £600 made available. The sources are not 100% clear, it reads like the school was opened for business in 1893 or 94 with 29 pupils. That original building is still standing, one can see it was solidly build, and still in use at the school. Just across from the town hall is the museum, it is privately run, how much the municipality is involved with it I am not sure. The museum is a single room with the council conference table and chairs in the center. Exhibits are around the periphery of various aspects of the town's history. Most of the information on this page is sourced from there. 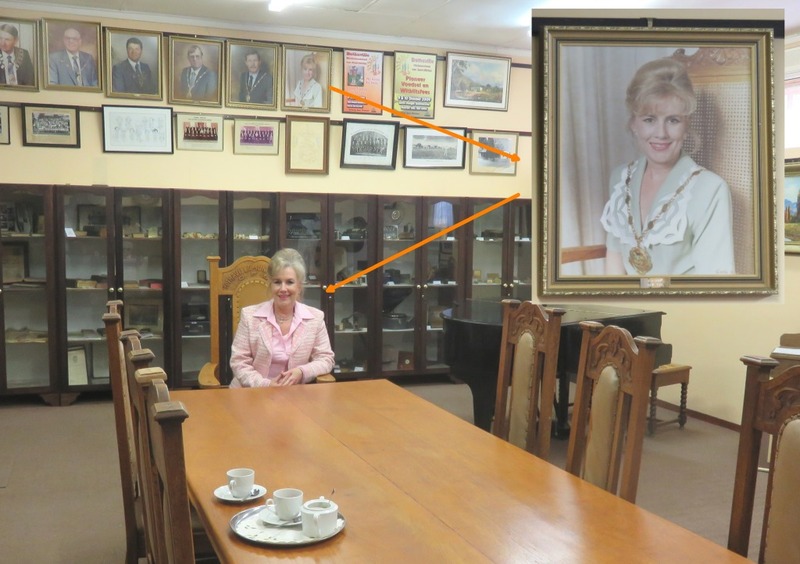 When we took pictures of the place we were honoured by the presence of the last white (sorry to have to refer to race) of Bothaville, Ray Brink, sitting in the same chair that she used to chair council meetings from. The portraits of some of the mayors are hanging on the wall above with hers being the last picture. Her tenure came to an end in 1995. She not only served the town during these transitional times she was also on the constitutional committee of CODESA. Those were the negotiations that took place between all the parties of South Africa before the first democratic election in the early 90th. Yes, there is one, but its not in use anymore, at least not for passenger traffic. The rails don't look like being in use. Talking to a local it was established that on average they see one train a month. Such a pity when one looks at all those grain silos around there and all that bulk traffic going by road. No wonder the road coming into Bothaville from the north is in a shocking state (that was Feb 2017). Don't know about the other roads. The line was constructed in 1916 linking Bothaville to Vierfontein. The line was later extended to Wesselsbron and Builtfontein and a big station building erected in 1936. 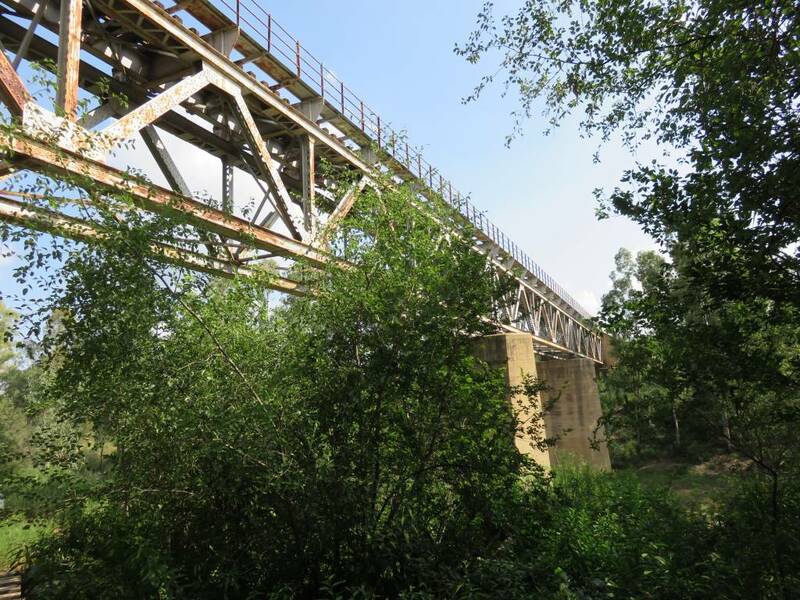 The bridge over the Vals river is for the rail going south, thus not erected until after 1916. The wagon bridge was a major step forward for the town. Until it was constructed in 1913 the route into town was through a drift over the Vals river. It was a difficult drift with its high banks on either side and impossible to cross after heavy rain. There were times when transport riders were stranded for weeks, unable to cross. The picture on the right shows what is still visible of the drift, or rather the approach to the drift, this one from the south. 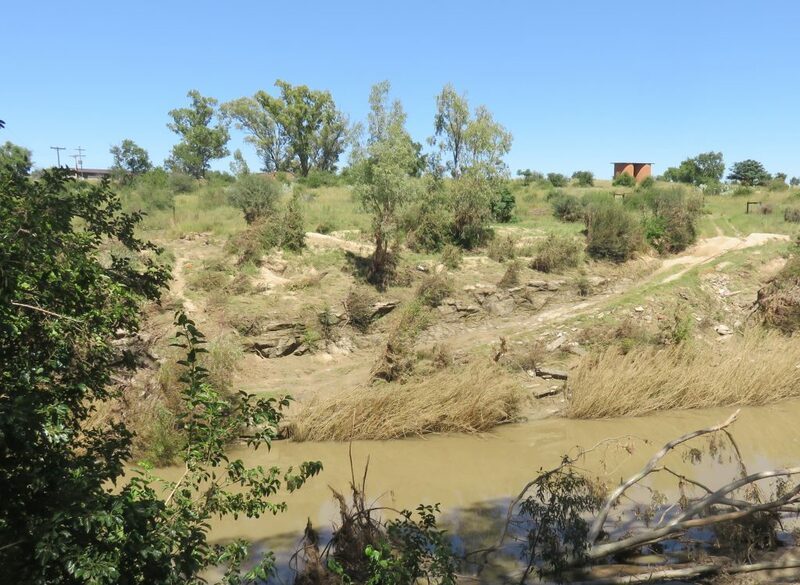 It is situated close to the new bridge of the R30, just down stream from it and upstream from the wagon bridge. 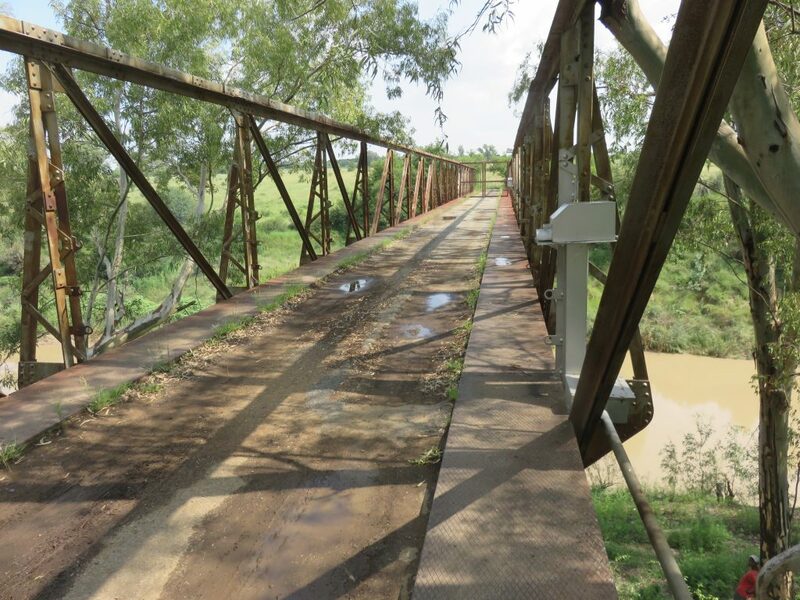 The bridge has been replaced by the road bridge of the R30/R59 and is not in use. The scrap collectors have already left their mark, the railing has disappeared. And that happened between our first visit in 2014 and now, 2017. There is a large number of silos, but here I want to show the original silos built in 1924 or just before. This is a standard design, I have written about them and the history in the Viljoenskroon wep-page. 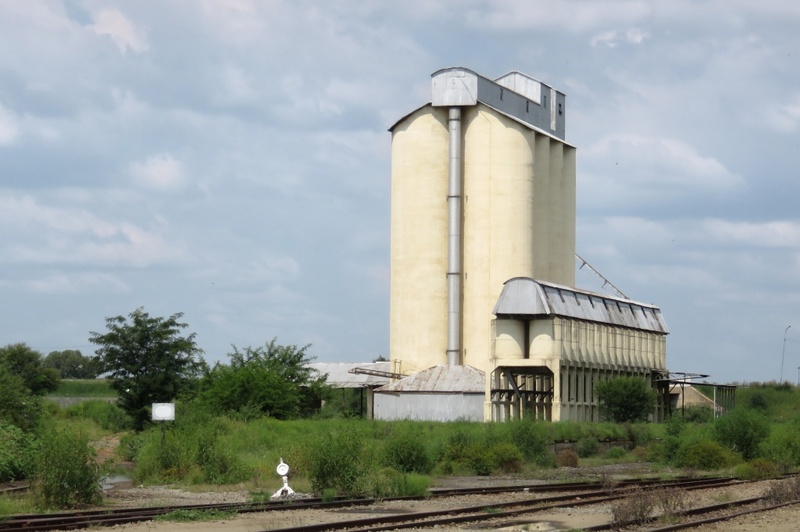 Ref 4 covers the history of these early silo installations. They are not in use and everything is locked up and barricaded to prevent the scrap collectors from accessing the place. I would love to have a look inside to see the machinery. See the Val web-page, there they had one of those large, slow moving diesel engines. NAMPO stands for the National Maize Producers Organisation, in this case I am referring to the NAMPO exhibition held once a year near Bothaville. It is said to be the biggest of its kind in the southern hemisphere. It is mainly a technology exhibition, with some livestock as well. I love going there, although not being a farmer, just to admire the new big machinery and to see how the business of farming has changed since my childhood when my dad was ploughing with horses. Here I can at least pretend to be driving one of those monster machines, like this one, a combine harvester with a 12 meter cutting width. 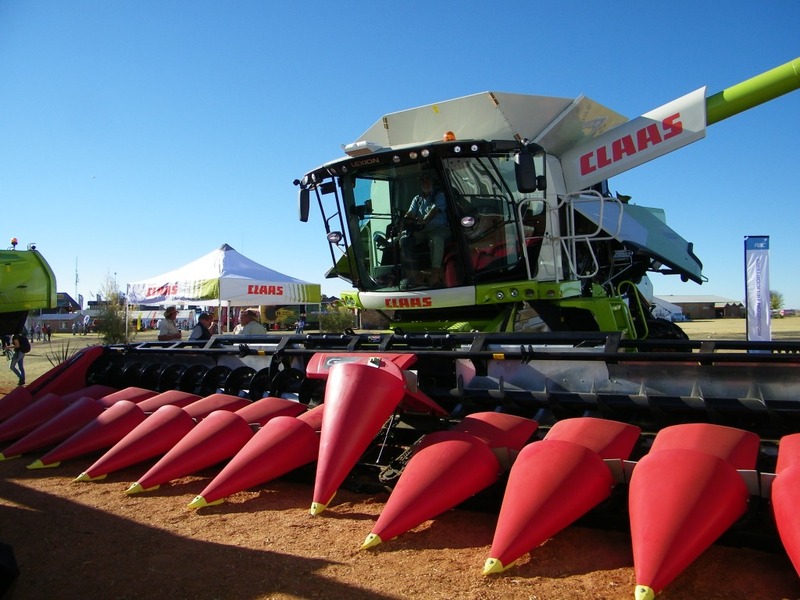 One can easily harvest 200 hectares a day. 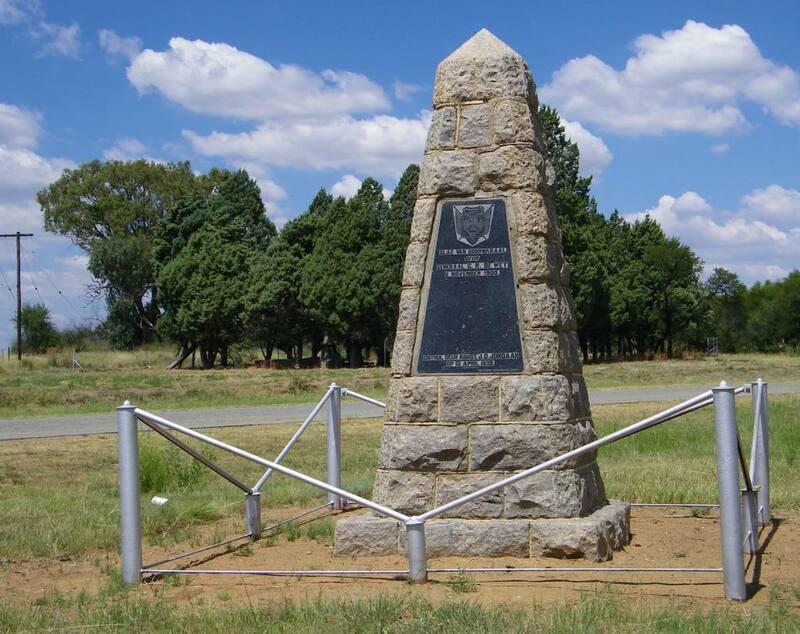 To the south of the town, about 10km out on the R59 is the monument to commemorate the battle of Doornkraal. 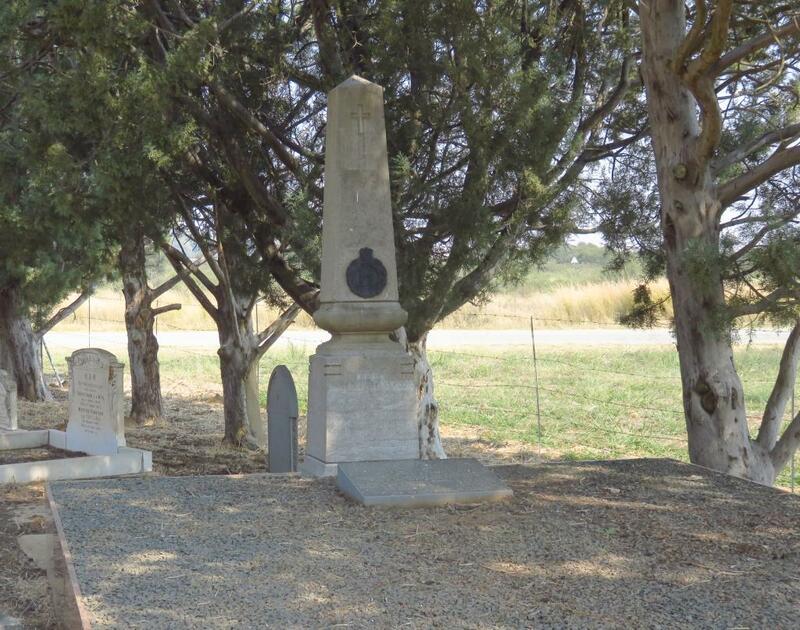 CR de Wet was involved here, he had collected the president of the Free State at Ventersdorp and was moving south, evading the British as far as possible. At Bothaville he made contact with the enemy and shots were fired. De Wet was not, at that point, in a position to make a stand and crossed the Vals River moving south out of harm's way. About 10km south he thought himself to be safe and established a night camp behind a hill. To be sure he posted sentries towards the Vals to warn of any British movement. Some of the sentries reported back in the early morning that there was no sight of the enemy. But shots rang out a few minutes later, the British were close. There was hardly time to put up any defence, some of the Boers took flight. The general tried to get some order established, to no avail and also the men defending eventually had to withdraw. President Steyn and his staff, as well as the treasury were all safe. The same event seen from the British side. They crossed the Vals early in the morning, while it was still dark, unseen by de Wet's sentries. The remaining sentries, those that were still there after the first group reported back to de Wet, were caught napping and taken prisoner. The costs were heavy, 9 dead, 30 wounded and 100 taken prisoners on the Boer side and 12 killed, 33 wounded on the British side. The most prominent was colonel PW le Gaillais, for whom De Wet had high praise, in his book 'Three Years War' ref 5, he stated as 'without a doubt one of the bravest English officers I have ever met'. 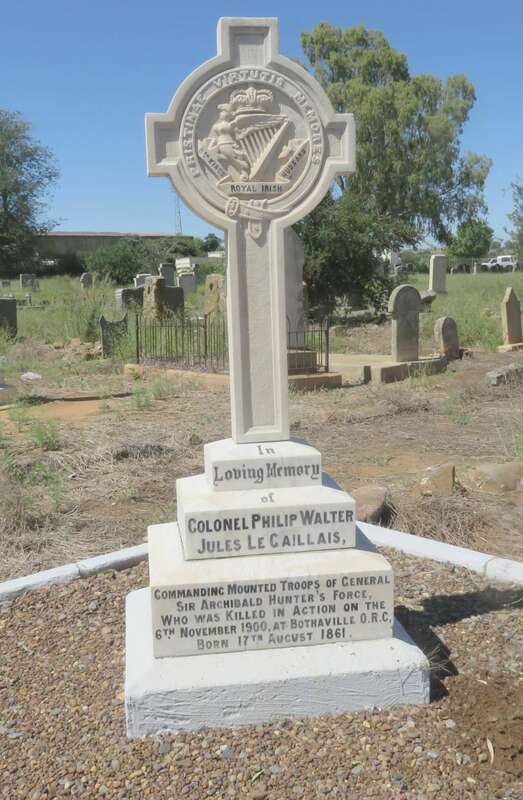 His grave is in the cemetery in Bothaville, the inscription states: In loving memory of Colonel Philip Walter Jules Le Gaillais, commanding mounted troops of General Sir Archibald Hunter's force, who was killed in action on the 6th November 1900, at Bothaville O.R.C. born 17th August 1861. 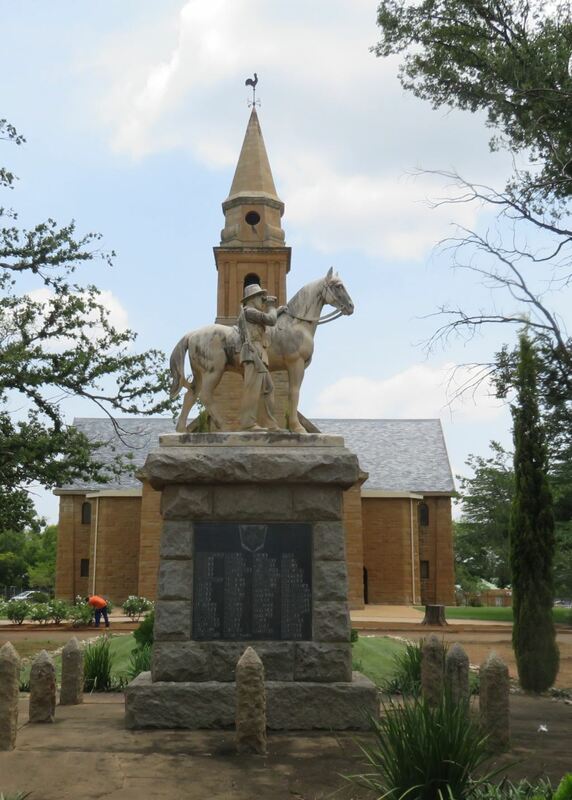 Bothaville was occupied by the British during October 1900 and later in the war the whole town was burned down by the British, except for the church.In the church yard is the monument to the fallen soldiers of Bothaville and surrounding, all the names are inscribed on it. It was inaugurated in 1938 by the then Prime Minister JBM Hertzog. 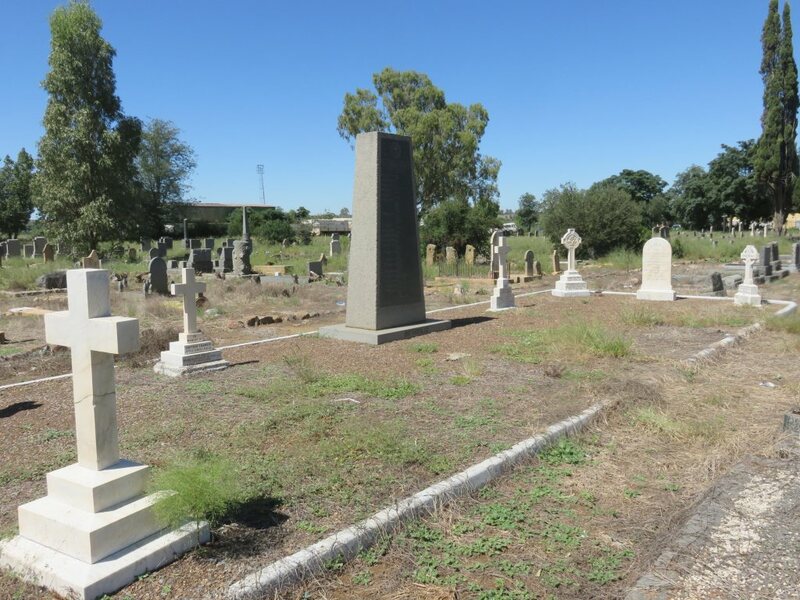 Passing through town on the R30/R59 the old graveyard is on the left hand side. In the middle of it are the British war graves from the Boer War. 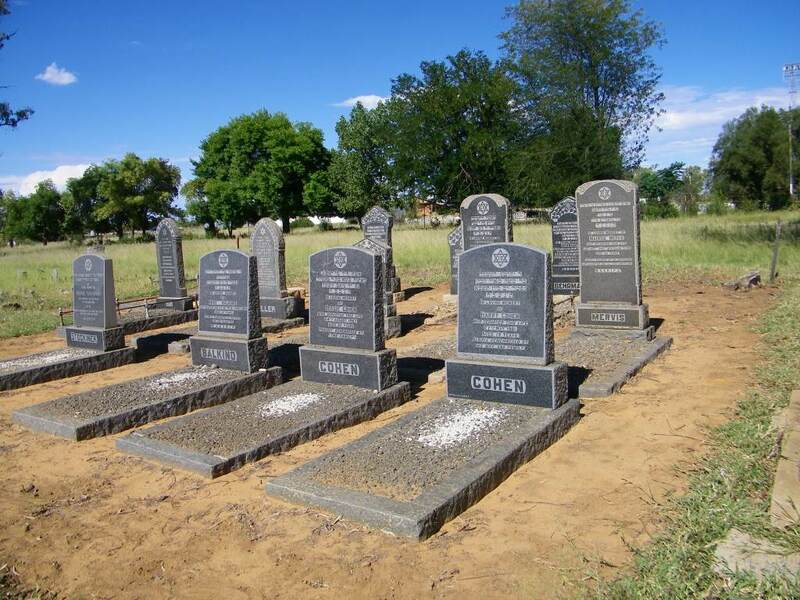 As we see in all the cemeteries in the Free State there are a number of Jewish graves. Ref 3 gives some details about the history of the Hebrew community. In 1910 they numbered 12 families, a synagogue was built in 1929. The number of families remained around 16 to 20 families until about 1953. I presume after that there was a decline with none or only very few still living here, I have no exact information on this. 4. Bothaville 1891-1966, published by the town council. Acknowledgment for pictures from Colin Redmayn-Smith, for the picture of Balkfontein received from Hanlie Mouton at the Info Center and for material copied in the museum.